Your involvement in school activities is one more way to convey to your child that you are interested in his/her schooling Topa Topa PTA supports many on-campus programs, such as; Art Trek, Music, Librarian Playground Equipment, Computer Lab, Teacher curriculum support funds and more! And, we could always use more support! Please consider joining today. It costs $15 per year per person to join the Topa Topa PTA - and these funds go directly to support these important programs. 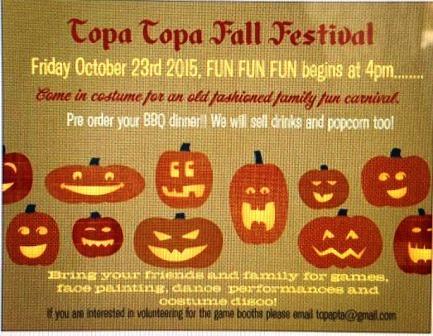 Email topapta@gmail.com for membership applications. Card” or “Renew” and follow the prompts. There are many opportunities to volunteer for our school. Please review our volunteer openings and offer your time to help make our programs a success!